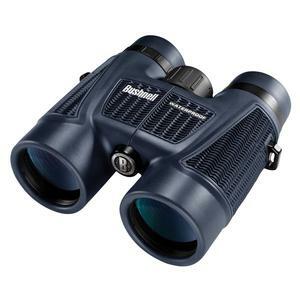 New 2012 design of Bushnell's popular H20 range, the Bushnell H2O 8x42 Full Size Binoculars pack powerful, bright optics into a 100% waterproof package. If you like spending time around water, but fishing your binos out of a pond or snowbank isn't what you had in mind, never fear. Waterproof construction and textured, non-slip rubber pads give you a grip on the situation, even where it is slippery, wet and wild. The ultimate on-the-water viewing companions, our ever popular H20 binoculars have been enhanced for 2012 with a Soft Texture Grip to keep them on board and in your hands in the most challenging conditions. Just as before, they're O-ring sealed and nitrogen purged to ensure stunning views no matter how wet they get. To maximise light transmission and clarity, standard equipment includes multi-coated optics and premium quality BaK-4 prism glass. From the streamside to cruising along the Thames, the world simply looks better through the Bushnell H20.